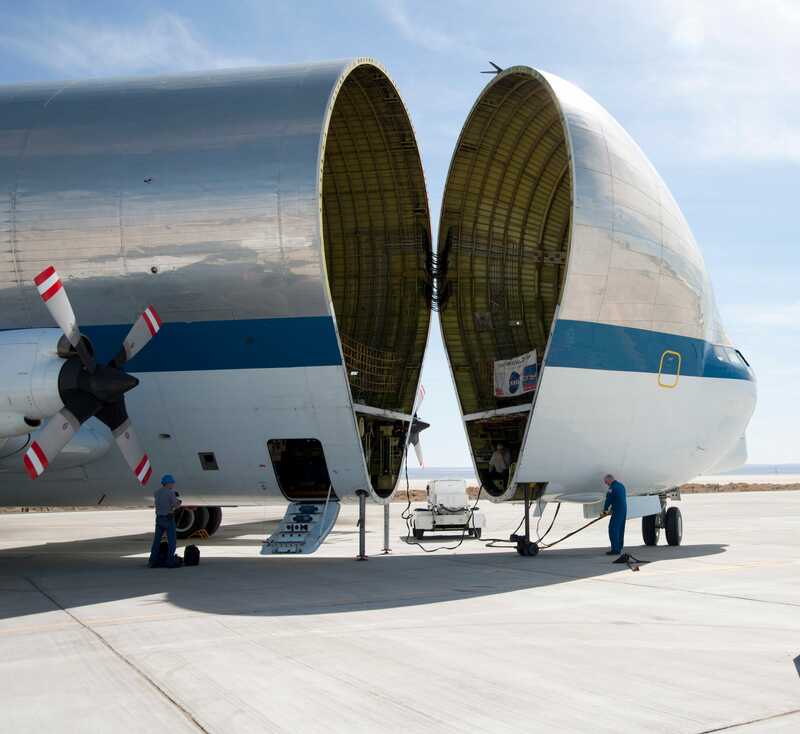 NASA’s Super Guppy is big enough to fit entire planes in its teardrop-shaped cargo hold. It’s as close to a flying babushka doll as an aircraft can get. Its main function is to transport spaceship parts around the world, including components of a the world’s biggest effort in manned space exploration: The International Space Station. And earlier today Canadian astronaut David Saint-Jacques tweeted a photo of NASA’s Super Guppy on the tarmac in Houston, Texas, one of NASA’s major bases of operation. 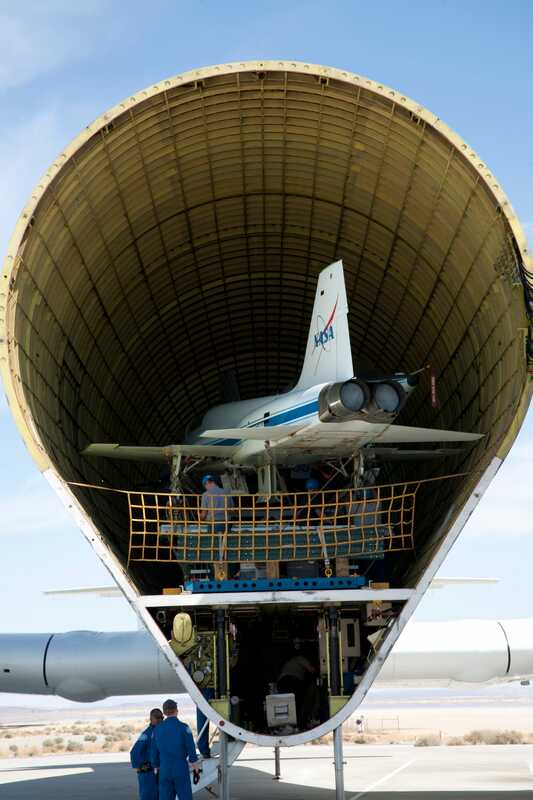 NASA got the Super Guppy as part of a barter agreement with its European counterpart, the European Space Agency. The transport plane’s cargo hold measures 25 feet in width and height and 111 feet in length. 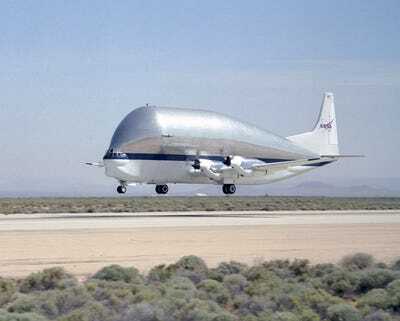 According to NASA, the maximum payload the Super Guppy can carry is 26 tons. NASAA retired NASA T-38 trainer mounted on a transport pallet atop a mobile transporter are positioned for loading aboard NASA’s Super Guppy prior to ferrying them to El Paso, Texas, for disassembly. Those metrics easily beat that of many military-grade transport planes like the venerable C-130 Hercules (even the bigger variant of the Hercules has a cargo hold just half as long as the Super Guppy’s, and the plane can carry up to about 22.5 tons). The Super Guppy’s loading mechanism isn’t exactly the kind of thing you could quickly use on a battlefield — loading two planes takes nearly three hours, for example. But it’s also what gives it such awesome scale: The entire nose is hinged and sits atop wheels that can open the cargo hold to up to 200 degrees. Even though one of the Super Guppies was acquired from the European Space Agency, the original was US-made, as was its ancestor, the Pregnant Guppy. “The Pregnant Guppy had humble beginning on the proverbial cocktail napkin,” writes a website dedicated to the history of the Guppy family of aircraft. A few entrepreneurs “were discussing the problems NASA was having transporting the rocket booster stages aboard ships through the Gulf of Mexico” and hit on the idea of addressing that problem using a giant, oddly shaped plane. 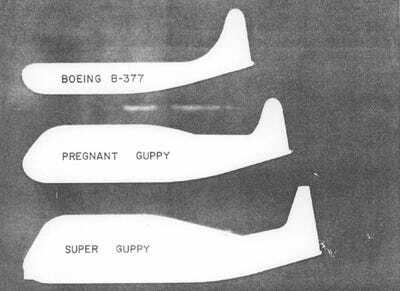 The Pregnant Guppy was built from Boeing parts and first flew in 1962. It carried components used in the Apollo space program which eventually put twelve men on the moon. But it was cannibalised for spare parts in 1979.